Chris Howard wanted to play baseball, but his high school didn't have a team. Instead, he turned to football, according to the college he'd later coach at, the Pennsylvania College of Technology. "I was very fortunate that football gave me the opportunity to get to college on a scholarship and to further my baseball career," Howard told the school in 2006. That path paid off for Howard in his chosen sport of baseball. It paid off with trips to the majors in three separate seasons. 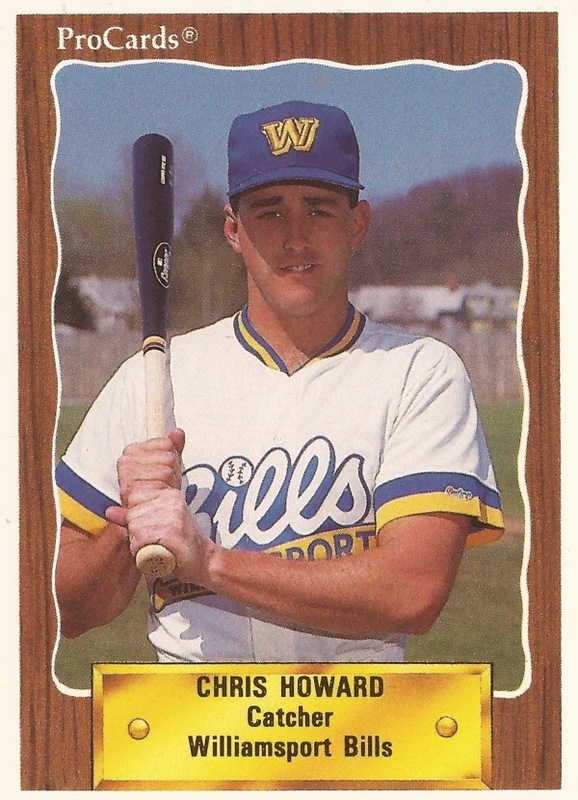 Howard's professional baseball career began in 1988, taken by the Mariners in the 41st round of the draft out of the University of Louisiana Lafayette. He went there out of Oklahoma. At Oklahoma, Howard won honorable mention all-conference in baseball in 1987. He played just two seasons on the football team, 1984 and 1985. With the Mariners, Howard started at short-season Bellingham and single-A Wausau. The catcher hit .245 between them. He first made AA Williamsport in 1989, playing there again in 1990. Years later, he would return to Williamsport again. An August 1989 Howard home run helped Williamsport to a win. In July 1990, Howard earned a mention as the Eastern League's best defensive catcher. That November, Howard made Seattle's 40-man winter roster. Howard moved to AAA Calgary in 1991, hitting .246 in 82 games. In September, Howard picked up two hits in a AAA playoff game. Then, Howard made the majors. He got into nine games for the Mariners, getting one hit in six at bats. Howard played 1992 back at Calgary. He then got brief looks back at the majors in 1993 and 1994 with Seattle. He got into four games in 1993 and nine more in 1994. Those games marked the extent of his major league career. He ended with 22 total games played and six total major league hits. Howard then played two more seasons in the minors, ending his career. By 2006, Howard was back in Williamsport, this time at the Pennsylvania College of Technology, serving as head baseball coach. He's continuing in that role in 2015.